Treat stains with Stain Solution or the Wash & Stain Bar. Focus on susceptible areas such as the pockets and pant hem. Have Raw Denim? Dye transfer and bleeding can be a “dark” reality of raw denim. To help set dye, presoak in a bath of cool water and Scented Vinegar. Always wash separately. Prepare to wash by turning denim inside out to prevent abrasion and lengthen the life of colorant dyes. Place inside of a Mesh Washing Bag to protect zippers, buttons, and any special detailing, embellishment, or distressing. Make sure the water temperature is cool when laundering blue or dark denim. When washing white denim, select hot water and add 1 capful of All-Purpose Bleach Alternative to the load. Add the appropriate amount of Denim Wash according to the machine type and load size. It’s not necessary to launder denim after every wear. 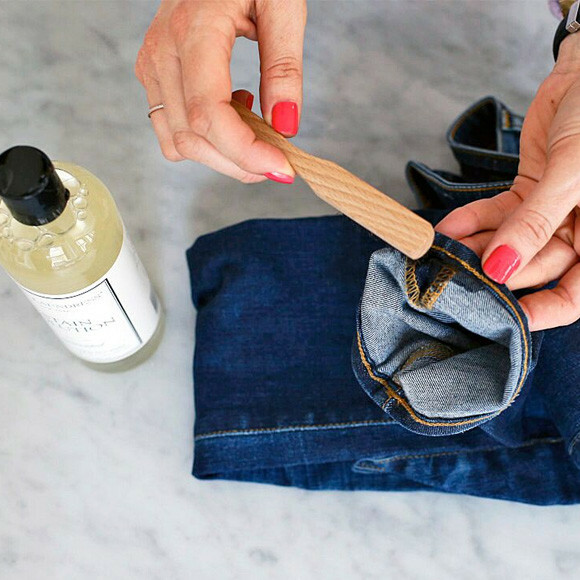 Use Fabric Fresh Classic between wears to keep denim smelling fresh. Freezing denim is not a cleaning method; however, steaming will help remove bacteria, and Fabric Fresh Classic has antibacterial properties. Always launder denim prior to making any alterations in fit or length. Use hot water and a hot dryer cycle to ensure there will be no further shrinkage. We invest a lot in our denim, so it’s important to care for it properly. Designed to give jeans a freshly laundered yet perfectly worn-in feeling, this duo thoroughly cleans, softens, freshens, and preserves the color of all your favorites.